Honeyhill Rosettes supply the finest quality rosettes, ribbon awards and custom printed ribbon at the most competitive prices with the best possible service. Whatever the event or occasion we can supply high quality products. All our rosettes are made from top quality satin ribbon, and are produced to very high standards of quality and finish. Colours from the top: white, yellow, gold, orange, cream, peach, bronze, brown, champagne, red, maroon, light green, green, dark green, jade, aqua, light blue, blue, navy, silver, cerise, pink, magenta, lilac, helio, petunia, purple, black. 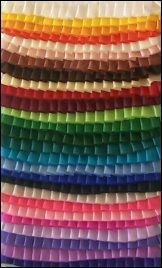 Rosettes can be made in any combination of colour or pleat, with stars or petals to give maximum effect. Tartan, spotted & gold edged ribbon is also available from stock. For that special event ribbon can be printed to your own unique design. Tails can be gold blocked with wording of your choice. Motifs - a large selection of motifs are available for rosette centres and badges. Personalised Motifs can also be made. Please contact us regarding last minute orders, and we will endeavour to meet your requirements.